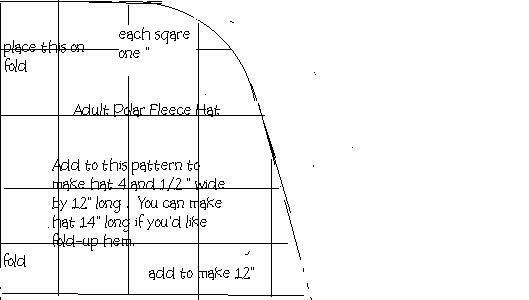 Knit Hat Pattern/"Rings of Color"
Lists of items needed and mailing info. Be sure to use very stretchy polar fleece! Draw out your pattern adding a piece to the bottom that is 7 " x 4 1/2" . This will make the hat a full 4 1/2" x 12. 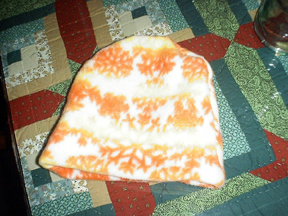 Do add extra fabric to the bottom if you want the hat to roll up (another 2" making the hat 4 1/2" x 14"). Cut out two piece of polar fleece, stretch of the fabric going across the width. Match up and serge or sew around the sides and top. Turn up 3 (5 for roll brim hat) inches to the inside and sew around the bottom edge (up 2 and 3/4"or 4 3/4 ") forming a hem. If you use a machine to do the side and top seams instead of a serger , you may want to sew using a small zig-zag so the seams have some stretch.